Reinstalled amplifier in rack. Power output was a bit high so I reduced it by retuning the output caps. 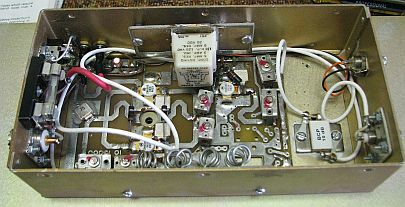 50 watts out to the duplexer. 40 watts out of the duplexer. 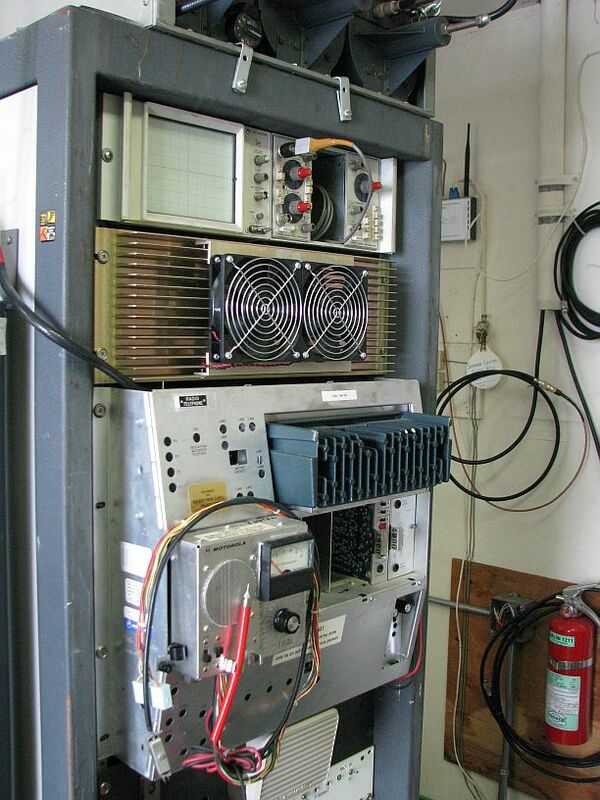 VSWR to the antenna coax is 1.3:1. Drive was a bit high at 12 watts, but lacking any way to adjust it, I left it alone. Done. The problem was the relay and something I hadn't seen before. It wasn't the contacts as is usually the problem. It was that the springiness was gone in the stiff copper armature arms. I could bend them to any position and they would not spring back. My guess is that 15 years of heating (the relay is always energized) heat treated the copper armature arms. 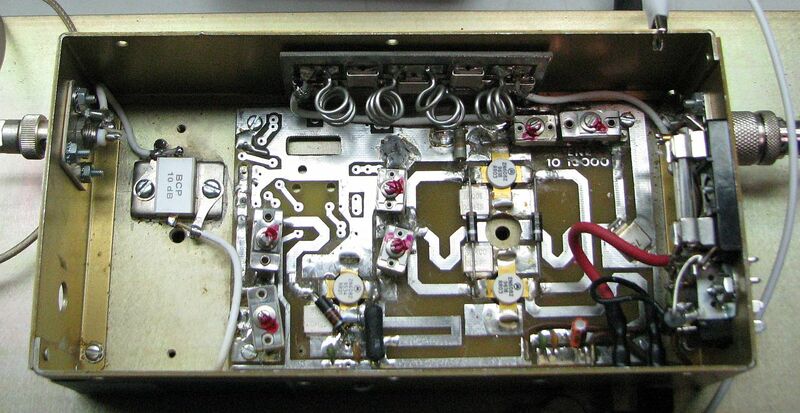 As the relay is not necessary for transmit only operation, I elected to remove rather than replace it. 8 watts in, 47 watts out at 12.3VDC. Not too horrible. Frequency sweep looks good. Harmonics down -50dB (all that I can see on my ancient spectrum analyzer). Note that the coax cables have been shortened considerably. This necessitated retuning the amp. 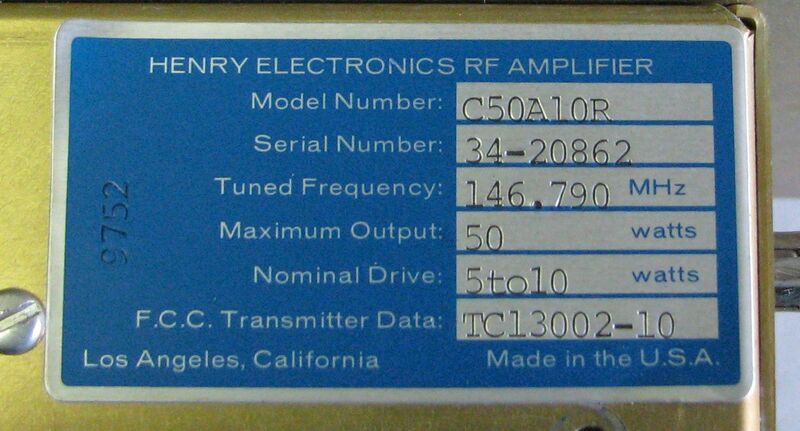 If everything were exactly 50 ohms, this would not be necessary. 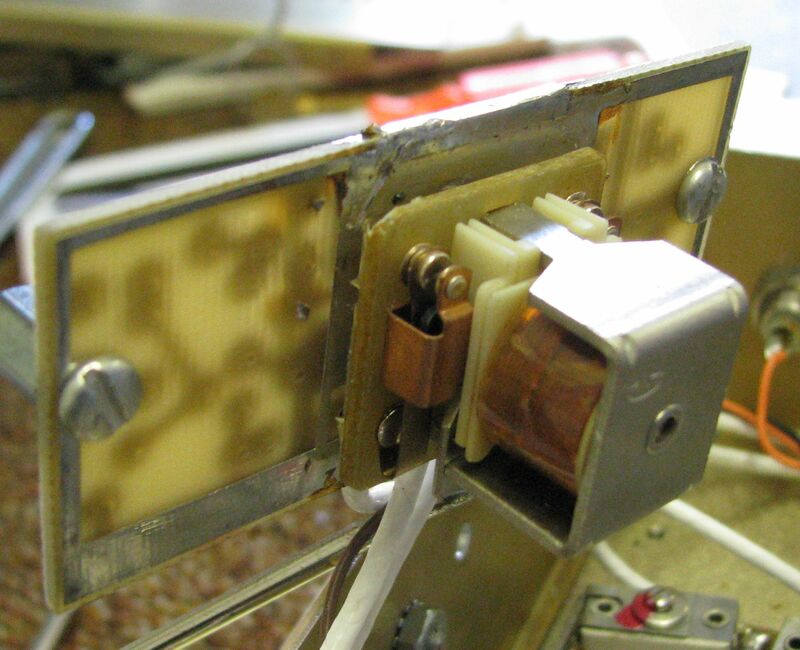 However, if you inspect the coax connectors and coax end, you'll see considerable exposed center conductor and shield length from shields to chassis ground. These are inductors and must be dealt with by tuning. I also applied additional nail polish to the compression caps. The idea is not to mark the correct tuning point, but to glue the adjustment screws in place so that they don't move. If you're going to do similar work with PTFE coax cable, the thermal wire stripper sitting on top of the wattmeter load is manditory. 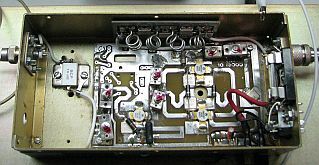 Removed amplifier for repair. Cleaning the relay didn't help. Some else is wrong. 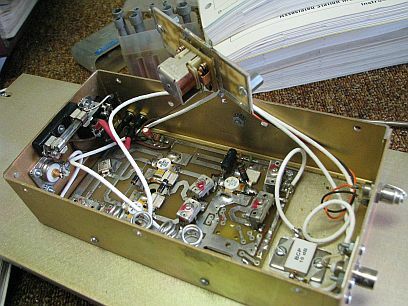 Note that the relay connects a maze of cables designed to deal with T/R switching, which we really don't need. I'm tempted to rip out the relay and remove the spaghetti. I cracked the cover of the relay while prying it off. Also note the -10dB attenuator at the amplfier input. 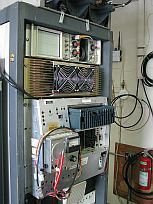 The Micor repeater lacks any power control at the driver level. 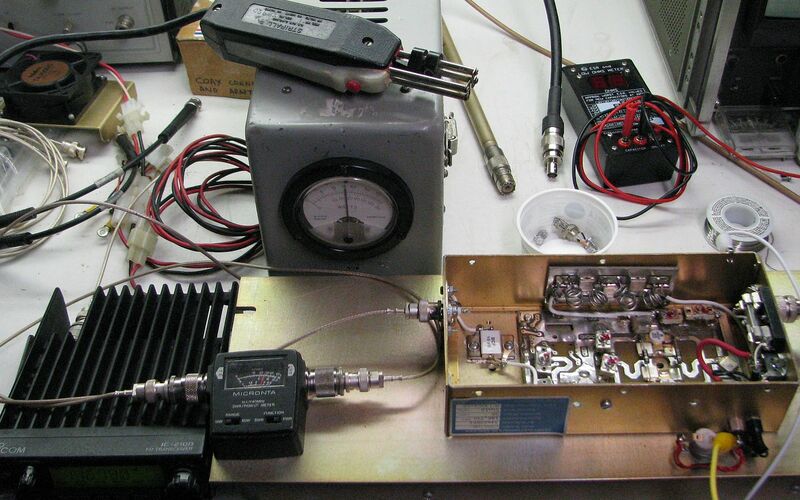 Therefore, an attenuator was required to reduce power down to the appropriate input level. 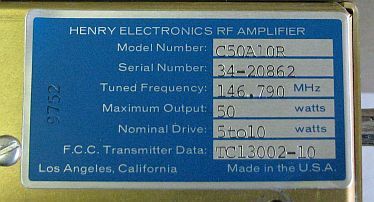 Diagnosed erratic TX failure to Henry VHF power amplifier. By disconnecting the power plug, the amp revereted to pass-thru mode so I as able to leave the repeater running on driver power (about 8 watts into the duplexer).